Kitware will be releasing an alpha version of a new toolkit called OverView alongside of the ParaView 3.6 release later this month. The OverView application was designed to support informatics analysis and visualization methods which can be applied to data from sources such as relational databases, spreadsheets and XML. The application supports features such as automatic graph layout, hierarchical organization of data, graph analysis algorithms and charting. 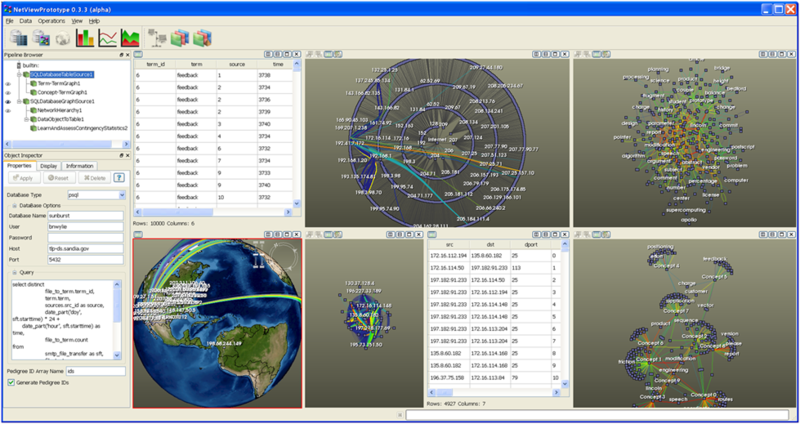 OverView also integrates 2D and 3D geospatial views for plotting relational data on the globe. Kitware, in conjunction with Sandia National Labs, will continue to explore and develop informatics tools which combine information visualization, statistical analysis, and linked views to facilitate interactive data exploration. Please visit sandia.gov/OverView for more information on this application and kitware.com for more information on Kitware’s Informatics solutions.